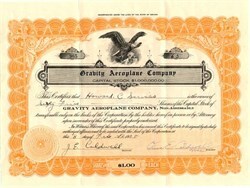 Beautiful RARE certificate from the Gravity Aeroplane Company issued in 1928. This historic documenthas an ornate border around it with a vignette of an eagle. This item has the signatures of the Company's President, J. E. Caldwell and Secretary. Olive E. Caldwell and is over 83 years old. Jonathan Edward Caldwell was something of a mystery even to his close relatives, and his strange career can only be reconstructed in spotty form through newspaper clippings, patent documents and newsreel scripts. According to his college records, Caldwell was born in the small town of Hensall, Ontario, Canada in 1883. He attended Oregon State College, Corvallis, from 1912 to 1913, majoring in mechanical engineering. In the 1920s, according to statements he made later in life, Caldwell became interested in aviation and began to study the fundamentals of aerodynamics, gleaning scraps of knowledge from textbooks and encyclopedias. In February 1923, while living in Santa Monica, California, he filed an application for a patent covering a rather bizarre aircraft -- a so-called "Cyclogyro" (Gravity Aeroplane) -- which was designed to take off vertically and transition to forward flight. The plane's "wings" were actually small airfoil blades mounted in Ferris wheel-like rotating frames protruding from either side of a conventional aircraft fuselage. The Cyclogyro patent was granted in the summer of 1927, but by the end of that year Caldwell, now living in Denver, filed another patent on an even more impractical human-powered, flapping-wing aircraft, or "ornithopter." This contraption looked like a rowboat with birdlike wings. These wings were equipped with dozens of flexible fabric valves which were supposed to open on the upstroke and close on the downstroke. Power for the flapping action was to be provided by the pilot, who would need to be highly athletic, to say the least. An aircraft having vertical takeoff and landing capability having at least first and second laterally extending paddle wheels rotatable on a central axis generally perpendicular to the longitudinal axis of the aircraft and between its nose and tail. Each of the paddle wheels has a plurality of blades pivoted by a system of linear actuators to a determined optimum blade pitch angle. One paddle wheel is positioned adjacent the port side of the aircraft and the other paddle wheel is positioned adjacent the starboard side. The pilot is able to operate the aircraft in all regimes of flight by differentially adjusting the pivot angle of each of the blades. In one embodiment utilizing only a pair of paddle wheels, differential operation of the blades provides lift, thrust, roll, and yaw control of the aircraft, while an aircraft pitch control rotor rotatable about a vertical axis distant from the paddle wheels is provided for controlling pitch of the aircraft. In another embodiment of the invention, the aircraft is provided with both forward and aft pairs of paddle wheels such that differential operation of the blades of the forward and aft paddle wheels provides pitch control of the aircraft without need of a separate pitch control rotor, while also providing lift, thrust, roll, and yaw control. With this concept Caldwell founded the "Gray Goose Airways" to raise capital to build his ornithopter and incorporated the firm under Nevada laws in 1928, with the first shares of stock being sold in Denver that year. He planned to issue ten thousand shares of Gray Goose stock at ten cents per share, while retaining a fifty-one percent interest, and actually succeeded in selling between $8,000 and $10,000 worth. By 1931 Caldwell had failed to produce a viable ornithopter in Nevada and Colorado and moved his enterprise to the east coast, evidently first to Orangeburg, New York, and later to Madison, New Jersey. In early 1932 he was actively promoting Gray Goose Airways as a new passenger and freight airline, with himself as secretary-treasurer and his wife Olive as president. A newsreel filmed on January 14 shows the Caldwells conducting a demonstration of the ornithopter, which was "piloted" in a futile attempt at flight by a man with the unlikely name of "Emile Harrier." According to the newsreel's script, Olive makes a statement to the interviewer in which she cites the examples of Alexander Graham Bell and Marconi, pioneers in their fields, and claims that the Gray Goose project "has not been an exception to the persecution of the experts." Evidently they had already taken their share of criticism. Construction of a prototype ornithopter was started at nearby Teterboro Airport and the company was authorized to issue $1,000,000 worth of stock at ten cents a share. Things seem to have been going smoothly until that September, when New Jersey Assistant Attorney General Robert Grossman charged Caldwell with fraud. Grossman found that Caldwell had been voted a fifty-one percent block of Gray Goose stock in exchange for his ornithopter patents, but the certificates were never used because, in Grossman's words, "the defendant company never had money enough to pay for the internal revenue stamps required to be affixed to the certificates of the stock." Grossman also charged that construction of the impractical ornithopter prototype had wasted thousands of dollars of the company's money, and that "no one connected with the company possessed sufficient knowledge of aeronautics to build a practical ship." Caldwell and Grossman wrangled for the next few weeks, and the court finally agreed to give the inventor until early December to complete and demonstrate the prototype, on condition that he stop selling stock. Presumably Caldwell was never able to satisfy Grossman. Within a few months, Gray Goose had been moved back across the Hudson River to New York. That state's officials also began to ask questions about Caldwell's business techniques, and by 1934, he had moved his shop and family to the Washington, DC, area. According to telephone records, Caldwell set up Gray Goose Airways in an office at 1225 New York Avenue, NW, just three blocks from the White House. About that time he filed a prospectus with the Maryland Securities and Exchange Commission describing Gray Goose Airways' latest project, a new type of autogyro, as a "disk-rotor plane." (New Jersey Attorney General Grossman had noted in his 1932 complaint that Caldwell had already begun work on the disk-rotor plane in Teterboro.) According to Caldwell's filing, he envisioned this craft as a "cheap, safe and convenient general utility aircraft capable of taking off and landing in a small yard or on the flat roof of a building." The production plane would carry four or five passengers and would be priced to sell below the cost of the most inexpensive automobiles, Caldwell claimed. Incorporating partners of Gray Goose Airways in Maryland included Caldwell, Willis H. Ruggles, Lina Johnson and Gordon A. Crandall. While other inventors had tried circular wings before, Caldwell's approach was unique in one respect: his plane's wing was actually a twelve-foot, fabric-covered disk mounted on a rotating hub. It functioned as a combination wing and autogyro rotor. Four very small blades were grafted to the rim of the saucer, providing reaction surfaces which would cause the whole assembly to spin as the aircraft rolled forward. Power was supplied by a small nine-cylinder air-cooled radial engine and a two-blade propeller, and the pilot would steer the craft using a rudder and combination elevator-ailerons at the tail. The plane was otherwise much like a standard airplane of the period, built of a welded tubular steel framework covered by lacquered fabric. It would take off like an autogyro, but once it reached cruising altitude, the pilot would activate a brake in the rotor hub, locking the wing in a stationary position while the craft cruised along in horizontal flight at a top speed of about 100 mph. Near-vertical landings could be accomplished by reversing the procedure...or so Caldwell claimed. The prototype Gray Goose disk-rotor plane was completed near Washington between 1936 and 1938. The Civil Aeronautics Agency issued the experimental registration number "NX-99Y" for the craft. Around 1937 Caldwell also revived his 1923 Cyclogyro VTOL concept and started construction on a modified prototype. It was another far-fetched VTOL plane in the style of the impractical flying machines that graced the covers of magazines like Popular Science through the 1930s. The inventor attempted to mount two long three-bladed airfoil-equipped paddlewheels to the sides of a conventional-looking aircraft fuselage, but this time the axles of the paddlewheels ran fore-and-aft, parallel to the length of the machine's body. The airfoils were geared in such a way that as they were spun by the machine's 125-horsepower radial engine, they would theoretically produce enough thrust to lift the craft straight up. One of Caldwell's associates later claimed that this craft actually made successful "test-hops" to a height of about six feet. In Washington Caldwell finally hired some professional aircraft technicians to assist with the detailed design of the ambitious new machines. An aeronautical engineer named J. Owen Evans came aboard to work out the aerodynamics of the disk-rotor plane and the Cyclogyro, and a mechanic named Willard E. Driggers helped build the craft. The inventor also arranged with Dr. Louis Crook, an engineering professor at Washington's Catholic University, to make wind-tunnel tests of the Cyclogyro. Foreseeing wide military applications for an aircraft that would be able to take off and land vertically and hover in mid-air, Caldwell even approached the Army Air Corps with his plans. Unfortunately, the Air Corps wasn't impressed. Sometime in late 1937 or early 1938 (accounts vary), probably under pressure from his stockholders to produce results, Caldwell persuaded Driggers to attempt a test flight in the disk-rotor plane. The mechanic had never flown a plane at all, much less something as radical as Caldwell's funny-looking contraption. The plane was transported to the abandoned Benning Racetrack near Washington for the big event. According to later accounts, Driggers opened up the throttle and soon found himself forty feet in the air, supported by the whirling saucer-shaped wing and slowly gaining altitude. But seconds later, as he attempted to change course, he realized that the controls were not responding. Fearing for his safety if he continued to climb, he cut power abruptly and the plane slammed down some two hundred yards from its takeoff point, smashing the landing gear in the process but leaving Driggers uninjured. The fractured landing gear was eventually replaced, this time by a more up-to-date nose-wheel style unit, but time and money were running out on Caldwell's Washington company. Reportedly only about $5,000 short of the funds he needed to perfect his machines, the inventor had apparently lost interest in solving the problems of the disk-rotor prototype and had begun cooking up an even more outlandish VTOL rotorcraft design -- one that would completely eliminate the conventional airplane-style fuselage all his previous machines had used. He notified his investors that Gray Goose Airways stock was now being swapped for shares in a reorganized entity to be called "Rotor Planes, Inc.," established by himself and two individuals named P. D. Ellis and A. L. E. Samson. In 1939 Caldwell closed down Gray Goose Airways, let Driggers and Evans go, and moved his business and family once again, this time to Baltimore, where he set up a workshop on Edmonson Avenue on the city's west side. Here he persuaded another aircraft mechanic, forty-one year old John W. Ganz of Anne Arundel, to assist him (in return, predictably, for shares of Rotor Planes stock) and began work on the new "Rotorplane," which amounted to an attempt to reduce the autogyro to its barest fundamentals, virtually a flying rotor, with its powerplant, controls, and occupants housed in a compact disk-like hub.